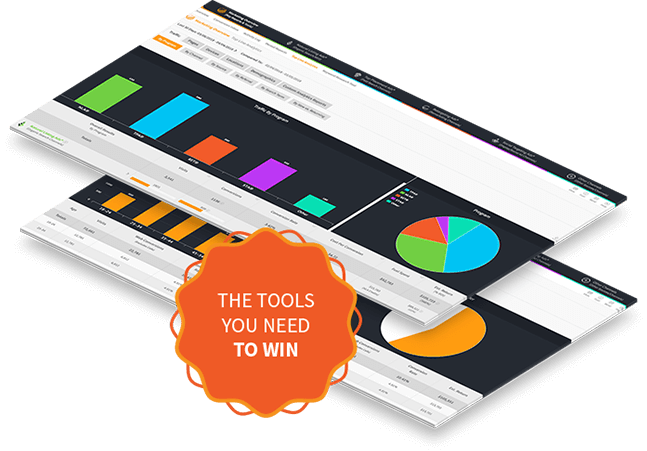 Get all analytics, reports, tracking & other important tools you need to win. Marketing 360® includes the analytics, reports, call tracking, and other tools you need to make the right decisions & grow your business. Everything you need to make the right decisions & grow your business with confidence. Having all the marketing tools & reports you need to grow your business in one platform saves you an incredible amount of time. There is nothing easier than using one platform & team to grow your business. One platform. One budget. One team. One login. 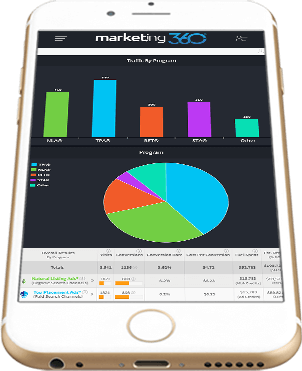 Marketing 360® has everything you need to grow your business in a single platform from design, to marketing, to CRM, to payments! The Marketing Overview report makes it extremely fast and easy to see how your marketing is performing across all your marketing programs and channels. From there, it’s easy to drill down into each program and channel to learn more. Or, you can call, email or text your Marketing Executive at any time with questions. Easily track all your conversions (leads & sales) from the Conversion Inbox. See details such as lead/contact name, phone, email, what marketing program/channel/keyword the conversion came from, phone call details/recordings, and more. Leave notes and rate conversions so your Marketing Executive can make your marketing better over time! The Top Line Analytics reporting section within Marketing 360® has everything you need to analyze your marketing and make the right decisions to grow your business. While other marketing platforms overcomplicate analytical reporting, Marketing 360® keeps it simple and focuses only on the reports that have the biggest impact. The Period Comparison reports within Marketing 360® make it extremely fast and easy to compare one period to the next and see what’s improving and what’s not over time. This is a great way to pinpoint areas of improvement from your marketing efforts. The Conversion Path report is a great way to visually see how different marketing channels work together to drive leads & sales to your business. This report, more than any other, helps you see the true value of a 360-degree marketing approach and how every channel is a key “link in the chain” of marketing success. Track all your conversions (leads, calls, sales) and what marketing program generated them from from the Conversion Inbox. Compare any period to another to see what’s improved and what hasn’t over time with the Period Comparison reports. The Channel report allows you to quickly compare results by channel, such as, paid, organic, social, referral, direct, email & more. The source report allows you to see results by source and medium, such as, Google, Bing, Facebook and thousands of other sources/mediums. See what sites and apps are driving the most traffic and results to your website with the Referral report. Analyze what paid and organic search terms are driving you the most visibility and traffic with the Search Term report. The New vs Returning report allows you to see how your new website visitors perform compared to your returning visitors. The Conversion Paths report allows you to visually see how each of your marketing channels work together to drive you results. The Page reports allows you to drill down into your website’s various pages and see what pages are performing the best. Quickly see how your website performs on different devices such as desktop, tablet and mobile with the Devices report. See how your website performs by gender (male and female) and various age ranges with the Demographics report. See how your website performs for different countries/territories, states/regions, and cities with the Locations report. Many more reports & tools are included within Marketing 360® to give you and your Marketing Executive the information needed to drive results. Everything you need to grow your business through a single platform. You’d be hard-pressed to find another platform that does anywhere near what Marketing 360® does for anywhere near the price. With Marketing 360® you get the talent and technology you need to grow your business, not just one or the other. We understand you’re busy running your business, so we provide the talent and support you need to make sure everything gets done at the highest standard. Because we do everything for you, it saves you time and allows you to focus more on the big picture and running your growing business. Not only does Marketing 360® save you time, it saves you money! Avoid an expensive in-house marketing team and high-cost software solutions. Marketing 360® includes it all for one low price! Marketing 360® is a momentum based system, meaning your online presence and overall results & return on investment get better and better over time!